This page gives information about the category based sponsorship for A' Design Award and Competitions. 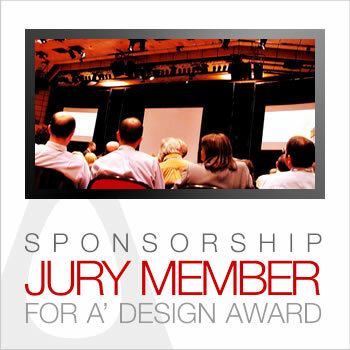 A' Design Award Jury Sponsorship is possible in 3 ways. The first, is being a Metal (Silver) Sponsor to an A' Design Award Category by providing a Jury Member that would evaluate the entries in all categories, The Second is by offering a Jury Member to evaluate results in only a specific Category which counts as Metal (Bronze) sponsorship. Finally individuals could also apply for being a jury, which will count as Metal (Bronze) sponsorship. The Grand Jury Sponsor is an entity or enterprise that provides three jury members to the competition. Plus your institution will get many direct benefits as explained here, in addition to the common benefits written here. There can be only three Jury Members from each company. This is a one-time sponsorship but can be repeated. Category Jury Sponsor is a sponsor company or organization who provides either two jury members or an important or famous Jury member to a given competition. This is a one-time sponsorship but could be repeated. Your institution will get many direct benefits as explained here, in addition to the common benefits written here. Individual Jury Sponsors are members of press, university professors or famous designers, who would like to support the A' Design Award and Competition by means of judging the entries. Your institution will get many direct or indirect benefits and exposure in addition to the jury package. Individual Jury Sponsors should apply here. Especially for Jury based sponsorship, members of sponsoring organizations, employees of the sponsoring companies, and the immediate family members of the sponsoring companies and organizations cannot enroll for a prize or award. The sole exception to this rule is universites where students can enroll even if their professors are jury members given that the student does not communicate her participation to the jury member. For custom competitions only the Jury members cannot join the competition. Individuals can also apply for being a jury, but in case their immediate family members and themselves cannot enroll for a prize. • If you are planning to organize a design competition, click here. • If you wish to organize a competition as a sub-event, check expo editions.